A town with over 300 lakes? Check. Over 850,000 acres of scenic trails? Check. Lumberjack competitions? That’s a big, Paul Bunyan-sized check. Welcome to the Wisconsin Northwoods. Hayward is a small town of around 2,300 people situated in Sawyer County, Wisconsin. For lake home and cabin owners, renters or visitors, Hayward is a prime spot for summer fun. It’s where nature, recreation and leisure come together to create a special home away from home. Nature and beauty are at the heart of Hayward. 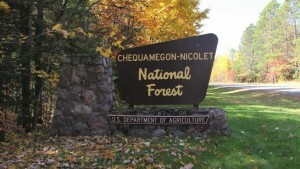 If you have a cabin or if you are vacationing, you must experience for yourself the Chequamegon-Nicolet National Forest. With 2,000 miles of streams, it’s only proper to get in some quality fishing time. Keep your eye (and fishing line) out for trout, walleye and bass that frequent these areas. Want to get down and dirty? Try one of the town’s most popular recreations: ATVing. Sawyer County has over 120 miles of state and national trails, so it’s no wonder why locals and tourists alike love experiencing the trails. In fact, a local sporting goods outfitter, Runamuk Rides, offers guided and unguided ATV trail adventures for you to experience. Although I don’t want to think about winter right now, snowmobiling is one of the best experiences owning or renting a cabin in Hayward will get you. It has some of the most fun snowmobiling trails in the areas and will make transitioning to winter in the Northwoods even easier. Summertime in Hayward is full of events for the whole family. A true musky festival would not be complete without a larger-than-life statue of a musky beaming in the heart of town. Every year Hayward holds the Musky Fest, the town’s largest community event. If there’s one thing you should know about owning a cabin in the Northwoods, it’s that locals take pride in their fishing. Celebrate this great tradition with live music, tons of food and beer, and carnival and family events. Musky Fest 2016 will be held from June 16-19. If you’re in the mood for some plaid-wearing, log-chopping, beard-watching fun, the Lumberjack World Championships will be held from July 28-30, 2016. Watch men and women from across the globe battle it out by climbing, rolling, running and chopping. On top of these events, experience the Ojibwe culture with several powwows that happen annually. While there’s no place like home, Hayward holds a special second home in many hearts. The Wisconsin Northwoods wouldn’t be complete without a beautiful, fun-filled summer at the cabin for the family to enjoy. Grab your fishing poles and lake gear; it’s time for the complete Hayward experience.